St. Jude Children's Research Hospital today launched St. Jude Cloud, an online data-sharing and collaboration platform that provides researchers access to the world's largest public repository of pediatric cancer genomics data. Developed as a partnership among St. Jude, DNAnexus and Microsoft, St. Jude Cloud provides accelerated data mining, analysis and visualization capabilities in a secure cloud-based environment. "Sharing research and scientific discoveries is vital to advancing cures and saving lives, especially in rare diseases like pediatric cancer," said James R. Downing, M.D., St. Jude president and chief executive officer. "St. Jude has shared data and resources since its founding, and collaboration with researchers across the world is at the core of our mission. St. Jude Cloud offers researchers access to genomics data and analysis tools that will drive faster progress toward cures for catastrophic diseases of childhood." These data have been generated from three large St. Jude-supported genomics initiatives: the St. Jude–Washington University Pediatric Cancer Genome Project, designed to understand the genetic origins of childhood cancers; the Genomes for Kids clinical trial, focused on moving whole genome sequencing into the clinic; and the St. Jude Lifetime Cohort study (St. Jude LIFE), which conducts comprehensive clinical evaluations on thousands of pediatric cancer survivors throughout their lives. The platform enables researchers to explore St. Jude data or their own results using innovative, interactive visualizations powered by ProteinPaint, the genomic visualization engine developed at St. Jude. The ProteinPaint visualizations allow users to rapidly navigate through the genome and identify genetic changes linked to cancer development. St. Jude Cloud tools also produce custom visualizations of the user's own research data for exploration or comparison with St. Jude-generated data. The data available on the St. Jude Cloud represent a key resource to understanding the genetic roots of childhood cancer. St. Jude's partnership with DNAnexus and Microsoft allows access to these data to harness the collective power of the global research community to advance precision medicine for rare pediatric diseases like cancer. "St. Jude Cloud is a powerful resource to drive global research and discovery forward," said Jinghui Zhang, Ph.D., chair of the St. Jude Department of Computational Biology and co-leader of the St. Jude Cloud project. "Providing genomic sequencing data to the global research community and making complex computational analysis pipelines easily accessible will lead to progress in eradicating childhood cancer. 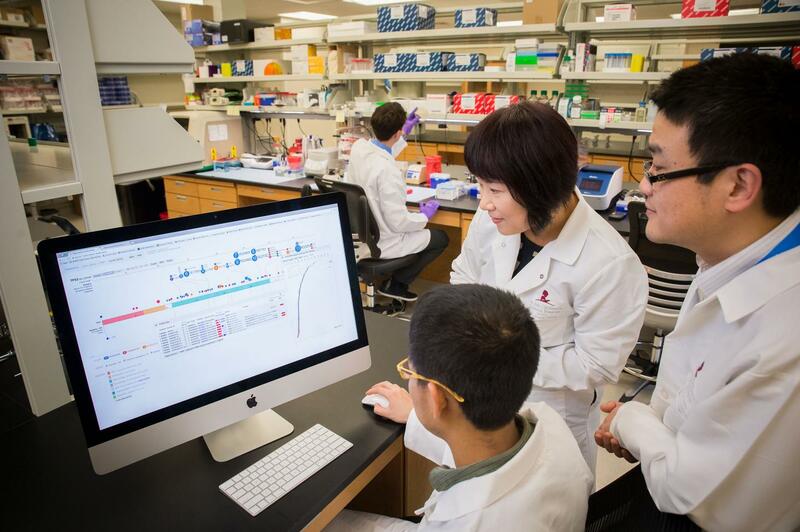 St. Jude has been committed to sequencing and understanding pediatric cancer genomes for nearly a decade, and we will continue to generate and share data with the research community in the future." "Health and technology partnerships are central to the advancement of scientific breakthroughs; allowing great minds and passionate hearts to work together with the common goal of ensuring one day, life-threating diseases in children are no longer a reality," said Peter Lee, Ph.D., corporate vice president, AI + Research, Microsoft. "We are extremely proud to collaborate with our research partners at St. Jude and DNAnexus and address the challenges of technological limitations, such as storage and the speed of accessing vast amounts of pediatric cancer data, and look forward to the progress that St. Jude Cloud will bring." "Collaboration fuels scientific advancements," said Richard Daly, chief executive officer at DNAnexus. "Whether you are working together across hallways or international borders, researchers need a secure space to foster collaboration and share data and tools. St. Jude has long been a leader in pediatric cancer and continues to develop new approaches to revolutionize the way medicine is practiced. We are proud to serve as the technology platform bringing together St. Jude researchers and their partners to advance cures for pediatric life-threatening diseases."